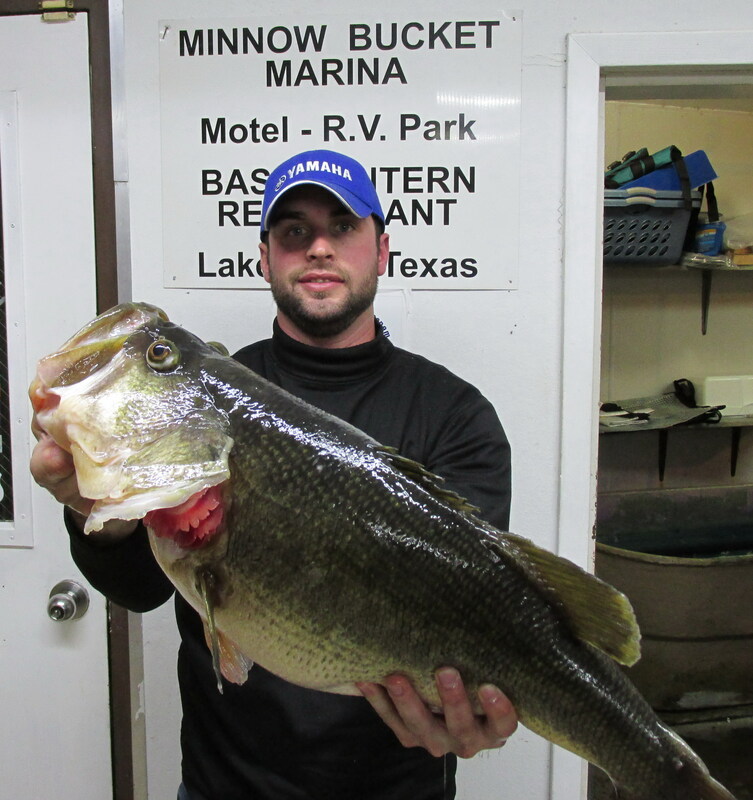 Lake Fork produced its second Toyota ShareLunker of the season December 27. The fish is also the second entry into the program during the current season. 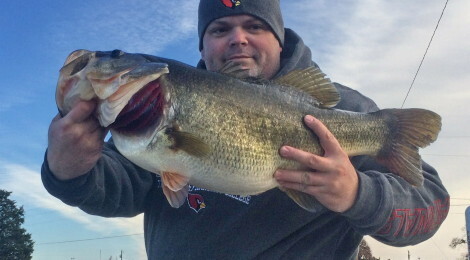 On December 30 Lake Athens produced its second ShareLunker ever, a 13.76-pound fish caught by Jason Lee Hanson of Athens shortly after 9:00 a.m.
Blake Eppinette of Downsville, Louisiana, caught the 13.6-pound Lake Fork bass about 5:00 p.m. and took it to the Minnow Bucket, an official Toyota ShareLunker Weigh and Holding Station. The fish was in great distress from an overinflated swim bladder after having been pulled from 30 feet of water. Despite valiant efforts by the angler, Minnow Bucket and Texas Parks and Wildlife Department staff, the fish did not survive. The fish was 21.5 inches in girth and 25.825 inches long. It is ShareLunker entry number 550. Hanson was fishing in 12 to 14 feet of water near the City of Athens water intake using a Norman DD-22 when Toyota ShareLunker 551 hit. He had been catching good fish all morning despite temperatures near freezing and knew he had a 13-pounder when the fish surfaced. Length of the fish was 27.75 inches, and girth was 20.25 inches. The last ShareLunker from Lake Athens was caught in 1987 and weighed 13.81 pounds. The lake record, 14.19 pounds, was caught in 1988 but was not entered into the ShareLunker program because it was not caught during the season, which runs from October 1 through April 30. Anglers entering fish into the Toyota ShareLunker program receive a free replica of their fish, a certificate and ShareLunker clothing and are recognized at a banquet at the Texas Freshwater Fisheries Center in Athens. The person who catches the season’s largest entry will be named Angler of the Year. If the Angler of the Year is a Texas resident, that person also receives a lifetime fishing license. Official ShareLunker weigh and holding stations have been established at a number of reservoirs; a list is athttp://www.tpwd.state.tx.us/spdest/visitorcenters/tffc/sharelunker/holding/. For complete information and rules of the ShareLunker program, tips on caring for big bass, a list of official Toyota ShareLunker weigh and holding stations and a recap of last year’s season, see www.tpwd.state.tx.us/sharelunker/. The site also includes a searchable database of all fish entered into the program along with pictures where available. Featured Photo: Jason Lee Hanson of Athens caught Toyota ShareLunker 551 from Lake Athens December 30. The fish weighed 13.76 pounds. Blake Eppinette of Downsville, Louisiana, caught Toyota ShareLunker 550 from Lake Fork December 27. The fish weighed 13.6 pounds.